The PC market crashed in the first quarter (Q1) of 2013 with new PC shipments falling 14% compared with the same period last year. 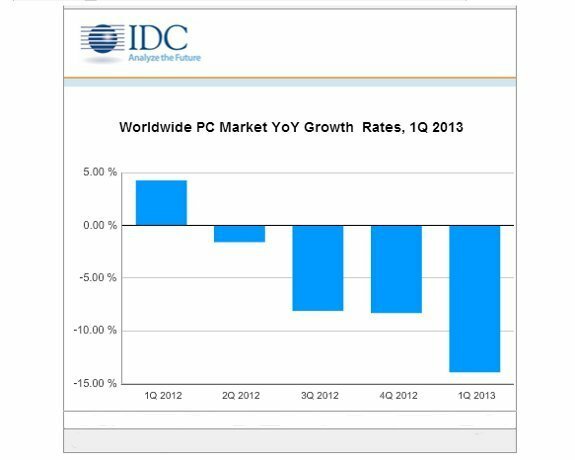 Analyst IDC’s latest worldwide quarterly PC Tracker, reported that shipments of new PC models offering Windows 8 were down significantly across all regions. Declining sales of mini notebook shipments impacted the low-end market according to IDC. In Europe, IDC said Windows 8 and touch-enabled devices remained slow. Shipments in the commercial market remained constrained as predicted, following continued economic pressure and lack of major IT renewals. As Computer Weekly has previously reported the major PC suppliers are struggling because enterprises are not refreshing PCs as regularly as they used to and, in the consumer sector, people are buying tablets rather than laptops. David Daoud, IDC research director, personal computing said: "The industry is going through a critical time and strategic choices will be needed to compete with the proliferation of alternative devices and remain relevant to the consumer. Suppliers will have to revisit their organisational structures and go to market strategies, as well as their supply chain, distribution and product portfolios in the face of shrinking demand and looming consolidation." IDC reported that sales of HP’s commercial PC shipments were affected by internal restructuring. Dell also saw a decline in PC shipments due to its restructuring efforts. Analyst Gartner also published its report on the PC market, showing a smaller, but still significant, decline in PC market share across all the major suppliers. However, according to Mikako Kitagawa, principal analyst at Gartner, commercial PCs are faring better than the consumer market. “The professional PC market, which accounts for about half of overall PC shipments, has seen growth, driven by continuing PC refreshes," Kitagawa said. "Despite the fact that some regions already passed the peak of PC refresh, overall professional PC demand continued to grow." Alan Pelz-Sharpe, research director at 451 Group, said users now have much more choice than before, which affects what they buy. "The battle [for PC suppliers] is meeting the middle ground between bring your own device (BYOD) and providing people with the tool they need to do their job," said Pelz-Sharpe. While hardware upgrades have traditionally been driven by the system requirements of new operating system software and applications, most PCs today are more than powerful enough to run most PC applications. He says smaller companies now have far more options for desktop applications, such as running Google Docs or OpenOffice, compared with being effectively forced to upgrade Microsoft Office. Some of the major hardware companies are starting to react to this. Dell acquired Wyse last year to move into the thin client market. Speaking to Computer Weekly, Steven Lalla, vice-president and general manager of the mobile products and solutions business at Dell says: "The Wyse business is growing 20% year on year. In a few years' time, it will be a multibillion dollar business." Thin client computing will still be small in comparison with the PC business, but he said, "For every dollar we sell on Wyse, we sell an additional $4 on IT infrastructure and services." 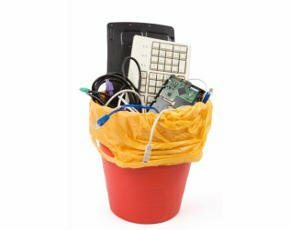 Lalla agrees that businesses are unlikely to switch en masse to thin client computing. "Until now it has mainly been deployed to comply with regulations in healthcare, financial services and education," he said. Dell is attempting to lower the barriers to thin client computing. It now sells a family of virtualisation appliances re-configured to run thin client workloads. For businesses that wish to take a pay-per-use approach to their end-user computing requirements, Dell now runs PC access in the cloud, from datacentres located in Slough, Dallas and Beijing. Quocirca analyst Clive Longbottom says suppliers are beginning to realise that mobile device sales are killing the PC market. "Wall Street can only see Dell as a PC company but Michael Dell is getting out of it," said Longbottom. He said Lenovo is tackling the decline in PC sales by offering multiple form factors. Of the major PC manufacturers, it was the only supplier in the top five whose sales did not decline according to Gartner's figures. Globally, growth was flat, but the company experienced 11% growth in Europe, thanks to an aggressive pricing strategy. Longbottom says PC suppliers need to move away from desktop hardware. and provide a way for users to access data and applications from any device. However, this approach to end-user computing will see the PC diminish in importance. "If the PC becomes an access device, its useful life span could be between five to 10 years," he said. "This would make it very difficult for any PC manufacturer to come up with something exciting." Freeform Dynamics programmer Tony Lock says the challenge with moving to some sort of desktop as a service business model is that most IT departments are not yet looking at PC procurement and are "not comfortable buying this way." Even though companies like Microsoft, IBM and HP offer financing, most business still consider their desktop PC environment as unique and so they tend to steer clear of such contracts..